There were more than 400 million people living with diabetes as of 2015. The condition caused an estimated 1.5 million deaths in 2012, and the World Health Organization (WHO) anticipates worldwide deaths from diabetes will double by 2030. Diabetic foot disease is one of the leading causes of disability across the world, with a mortality rate worse than many cancers. In Australia, diabetes causes more than 4400 amputations, and 10,000 hospital admissions for diabetes-related foot ulcers, many of which end with a limb or part of a limb amputated. Given the high mortality rate from diabetic foot disease, it’s difficult to train fourth-year podiatry students to debride dead or damaged skin to expose healthy skin underneath and encourage healing. “But learning the necessary scalpel skills to do this is challenging due to the risks of ‘practicing’ on such a high-risk population,” said Dr. Banwell. She and her colleague Dr. Ryan Causby are now printing 3D feet with wound-like cavities in place. Made from thermoplastic polyurethane (a plastic with many properties, including elasticity, transparency, and resistance to oil, grease and abrasion), each takes a week to print and costs less than $4 to produce. The addition of life-like ulcers and effects is added by the creative hands of UniSA’s podiatry team and can encompass anything from dry gangrene to oozing pus. 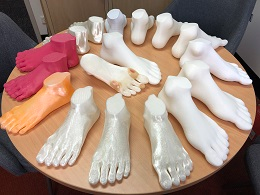 A blend of icing sugar, chicken stock and flexible resin is proving to be just the right recipe for creating realistic foot ulcers as part of the world-first podiatric training initiative at the University of South Australia.